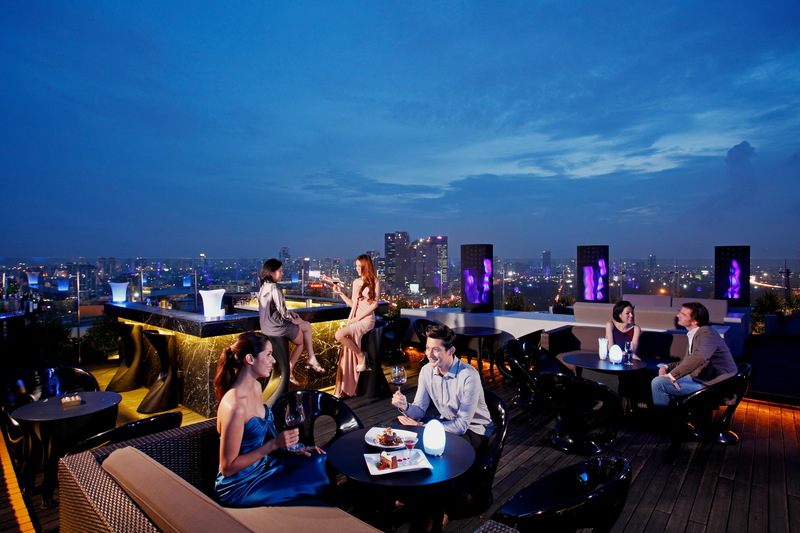 BLUE SKY AT CENTARA GRAND at Central Plaza Ladprao Bangkok has been named one of the 15 Most Exciting Rooftop Bars In The World, in a survey by Architecture Art Design website. Taking its place alongside other top venues in cities that include Singapore, Shanghai, Tel Aviv, Mandalay, Hong Kong and New York, Blue Sky’s architectural design and its views of the city combine to make it ideal for people with an adventurous spirit, says the Architecture Art Design website. Blue Sky, which is on the 24th level, is an urban bistro designed as an al fresco lounge, with a cool design that uses blue as a predominant colour and a broad perspective of the city skyline. There are no tower blocks in the immediate vicinity to obscure the view. The cuisine served combines Western and Asian tastes in an exciting menu that offers monthly promotions, and there is a long list of dazzling cocktails and wines of the world. The signature dishes include cromesquis scallops priced at Baht 450++; smoked and fresh salmon rillete priced at 250 TBH. French classic version of shepherd’s pie priced at 750 TBH; steamed snow fish priced at 980 TBH;; and griddled 200 gram Charolais French beef tenderloin priced at1,100 TBH. Centara Grand at Central Plaza Ladprao Bangkok is located on the northern side of the city, with stations for both the BTS Skytrain and the MRT Subway adjacent to the hotel. The expressway also passes next to the hotel, making this an attractive and convenient base for anyone who has to travel in Bangkok, whether on leisure or business.